GRAND RAPIDS September 29, 2015– The 2015 Willie Dale Jones Spirit of Solidarity Award for exceptional volunteer service by a west Michigan union member was awarded to Pam Marcusse (GRESPA-MEA) of Grand Rapids earlier this month. She was presented with the award at this year’s West Michigan Labor Fest on Labor Day. Pam is a familiar face to many in the Grand Rapids labor community. Whether she’s volunteering her time at labor’s monthly food trucks, or she’s standing up for her sisters and brothers at the Grand Rapids Grand Rapids Educational Support Professionals Association, her dedication to helping others is evident wherever she goes. This past month, Pam and her husband John helped organize the labor community’s monthly Feeding America food truck at their church, Wood Brook Cathedral in Grand Rapids. In addition to their usual assistance in food distribution, they worked closely with the church leadership to make sure the truck went off without a hitch, and she took the lead on community outreach. “Pam is one of those food truck volunteers that you can just count on, rain or shine, to be there,” Egan said. She is also very active in MEA-ESP (Michigan Education Association-Education Support Professionals), where she serves on a number of committees including the ESP Caucus Executive Board, the ESP Grassroots committee and works on ESP Public Relations. 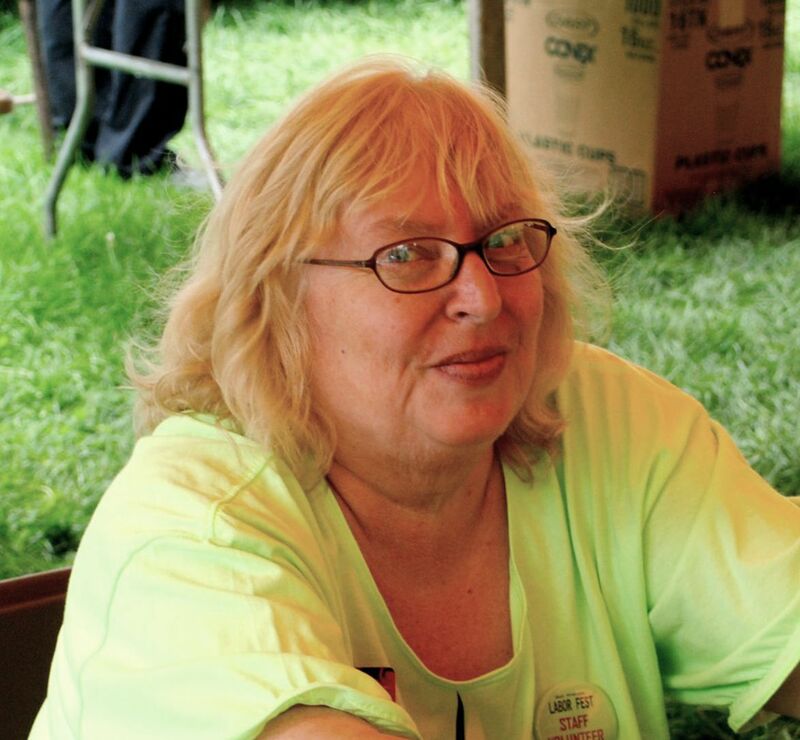 Locally, she is an active member of the Kent-Ionia Labor Council Community Action Team, and for the past two years she has been active in planning West Michigan Labor Fest. This year for Labor Fest, she worked on marketing the event at Metro Cruise with her husband. And at the event itself, she was an all-day presence, making sure everything went smoothly at the numerous booths and tables around the park, and with the dozens of volunteers. The Willie Dale Jones Spirit of Solidarity Award is given annually in recognition of labor volunteers who go above and beyond the call of duty as volunteers in their community and union. Willie Jones was a retired UAW member—very active and beloved in the Grand Rapids labor community— who was abducted and brutally murdered in the spring of 1999. Four young men targeted Brother Jones after seeing him take out his wallet as he donated to a funeral fund at a local bowling alley. They stabbed and beat him and left him in a Mecosta County forest to die. The award named in his honor is given out annually at West Michigan Labor Fest. Anyone can submit a nominee to the Labor Fest committee, and committee votes on their selection just before Labor Day. “I am honored that others believe that I am doing right by my union and my community,” Pam said. “It’s also an honor to be given an award named for Willie Jones, because I believe so much in what he stood for. If you are interested in nominating someone for the 2016 Willie Dale Jones Spirit of Solidarity Award, send an email to info@KICLC.org with their name, local union and a brief explanation as to why you think they go above and beyond for their union and community. This entry was posted on September 29, 2015 by WMALC in Community service news and tagged church, Feeding America, Grand Rapids, GRESPA, ibew, Labor Fest, UAW, Willie Dale Jones.